Fri 14th Dec - Final day of school for 2018. 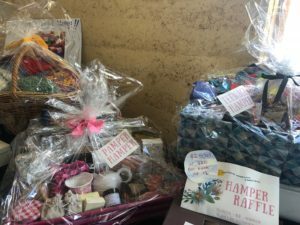 Have you had a look at the raffle hampers in the office? They are really impressive and even better value with a few new additions including a $100 voucher from Larder in Daylesford. Thank you to all who donated the beautiful prizes. Books of raffle tickets went home last week and now is the time to start returning them so unsold books can be reused and sold tickets can go into the draw. Tickets will also be on sale on the day of the Fair with the raffle drawn at 3pm. On the day we will also have a second raffle going. 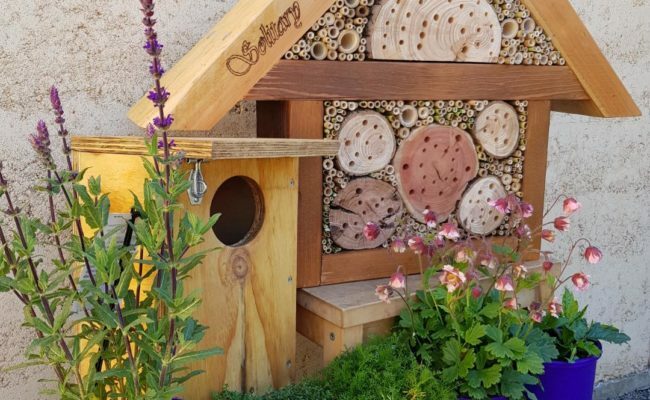 There is a collection of five more beautiful hampers – a Waldorf books and doll hamper; books, vouchers and toys for preschool aged children; books, toys and vouchers for young children; the stunning native bee hotel and pollinator plants hamper; and the grown and gathered hamper. A strip of five tickets will cost $10 and you get to pop each of your tickets into the draw for whichever hamper you want to win. All of the hampers are worth hundreds of dollars and each will be a delight to win. Raffles tickets are for cash sale (or eftpos), so plan to bring cash along on the day if you want to enter. Thanks to those who’ve offered to come in on Saturday and help set up. If you’ve got time or muscle to contribute, you’re very welcome. We could use another gazebo or sun umbrella if you have one we can borrow. We would also appreciate any flowers, greenery or vines you can bring in on Saturday or early Sunday. Thanks also to all those who are baking for the tea and cake stall. Please bring your cake boxes on Saturday or Sunday morning and leave them in the parents room. Tickets for activities will be available for purchase at the Fair entrances across the day for $25 or $10. These tickets are used to pay for children’s activities and can be used for food. Class 6 students will be holding their own little stall to raise money for charity as an extension of their Business Maths main lesson. Keep an eye out for them outside the main office and keep a few gold coins free to support their work. A copy of the program and map will go home later in the week but as usual the Fair commences at 10am with the Welcome to Country and opening ceremony. This will be followed by maypole dancing by children from classes 1 to 3. Classes 4 to 8 will perform their string ensembles in the Hall between 11am and noon. The Heartlands Stage will be open all afternoon, culminating in a set of pack up music at 3pm from DJ Sam Thomas. Old favourites such as tractor rides, candle dipping, gold panning, boat building will run all day. By popular demand Fish & Dip is returning this year and we have some new activities. Yoga Vivo and Circus activities (free) and face painting and sword training for budding knights. Pony rides will be available for an hour in the morning and an hour in the afternoon. 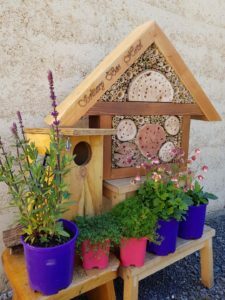 In the Kinder garden there are activities aimed at younger children including fairy gardening, pocket lady, puppet shows (free), bubble play (free) and the crystal cave. The food looks fabulous again this year. Tacos, samosas, gado gado and curry plates will be sold from Cafe Waldorf; and there are stalls selling pizza, BBQ and dim sum, cordial and icypoles and ice cream. Thank you for all your work and support. It’s going to be a lovely day. 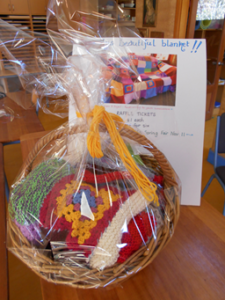 Class 8 students urge all of our CSSK parents, friends and students to get behind our Blanket Raffle, buy heaps of tickets and really show your support for an incredibly important social justice issue by raising money to support homeless youth. Every night on our streets more than four thousand young people have nowhere to sleep safely. 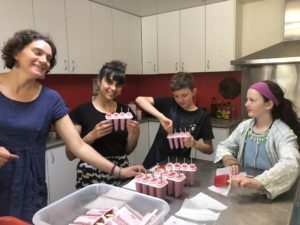 Every dollar we raise will go to Frontyard, a City Mission initiative that supports young homeless people under the age of 25. 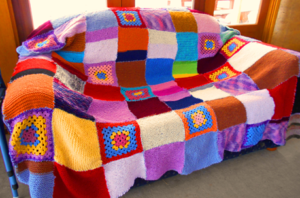 This beautiful blanket can be viewed in the office, so come along and purchase a ticket! Thank you so much for organising and repairing our stick house. It is very solid now and a great assert to the Kindergarten play space- the children will love it. I understand that it is going to have some more interior decorating, but so far it is safe for the children to play around, so I am very pleased, especially seeing as the Fair is so close at hand. I appreciate our lives are very busy so big thanks to Pete, Nick and Penny for taking on something else. 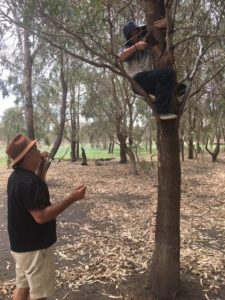 Thank you to all those who may have helped at the working bee too. Apologies for being absent today, the Department provided some funding to support Kindergarten teachers to become familiar with the new online Transition Report writing format, so I spent the day working out how to use the new Transition Report writing system. A big thanks to Amie, Rose and Fiona. I am sure you have found the letters in your parent pockets regarding the Transition Reports, if you do get a chance to look through them prior to the parent teacher interviews (for those of you who have signed up) next Monday that would be great. If not just bring them along and we will work through them together. What a fantastic time our class had performing its first play last week “Goldener”. 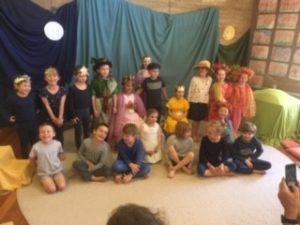 The children loved performing for other classes across the week and it was very special to have all the parents attend for the final performance. Morning tea afterwards was delightful and thank-you to those who brought a plate along. Our Parent evening meeting is coming up on Wednesday 21st of November. It will be great to see parents there and talk about our year as we move into the final weeks of 2018. 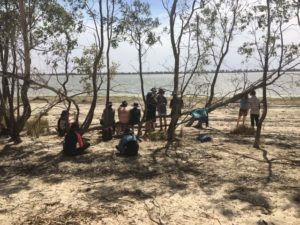 Last week Class 7 enjoyed a wonderful camp near Balranald. Thank you so much to Ron Murray for sharing this country with us. Spending time together, hearing stories, visiting special places, meeting friends and family, has been a very special experience for us. 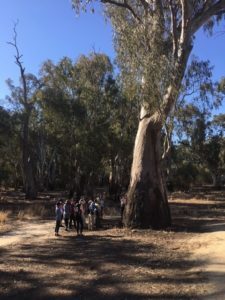 The Blade Tree near the shearing shed at Yanga. 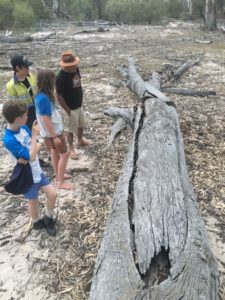 Ron showed us a fallen canoe tree near camp. I hope to see you all at our Parent meeting this Thursday. It is such a pleasure and privilege to have the opportunity to teach PE to Classes 4-8 for the remainder of 2018. I’ve had the opportunity to meet the classes and have felt warmly welcomed. My son attends CSSK and I already feel a strong connection and sense of familiarity at the school. My background qualifications are Bachelor of Physical & Health Education, Diploma of Vitality Yoga, Certificate IV in Health & Fitness (Personal Trainer) and I will be undertaking Steiner training in 2019. I love to dance, play netball & basketball, meditate, and get out in the garden. I value fresh food, use my hands, create, sing and love to connect. In our PE classes we will focus on developing skills with an intent for students to experience a feeling of success, relevance and enjoyment through a range of diverse activities during these last weeks of the year. Theatre Royal presents – an incredible opportunity for families to come along to a hip hop dance & cultural workshop with the very talented Yolgnu hip hop artist & dancer, Baker Boy. Thursday, 8th of November from 5 – 6pm. Baker Boy is a one of a kind performer & immensely skilled choreographer. 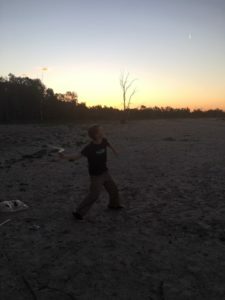 The Anglican Parish of Castlemaine is preparing for its annual FAIR ON THE HILL, to be held on FRIDAY 9th NOVEMBER, 3.30pm-7pm on Agitation Hill, Cnr Forest, Kennedy, and Mostyn Streets. This year we are introducing a colouring competition for primary school aged children;. It’s going to be a great night and this year its Western theme and Crazed Megsy and the Bandits are playing. Bookings are now open, see the link for details. A half size Atelier in excellent condition with semi-hard case & newly strung bow for $500.